Artists do not need monuments erected for them because their works are their monuments. When I went to check out the most famous church in Barcelona, La Sagrada Familia, exactly 20 years ago this year, my visit was very different from my recent trip. Unlike today only the Nativity facade was finished back then. There was no line to get inside the church because there really wasn’t much of an interior. I climbed part of a tower and surveyed the construction site. 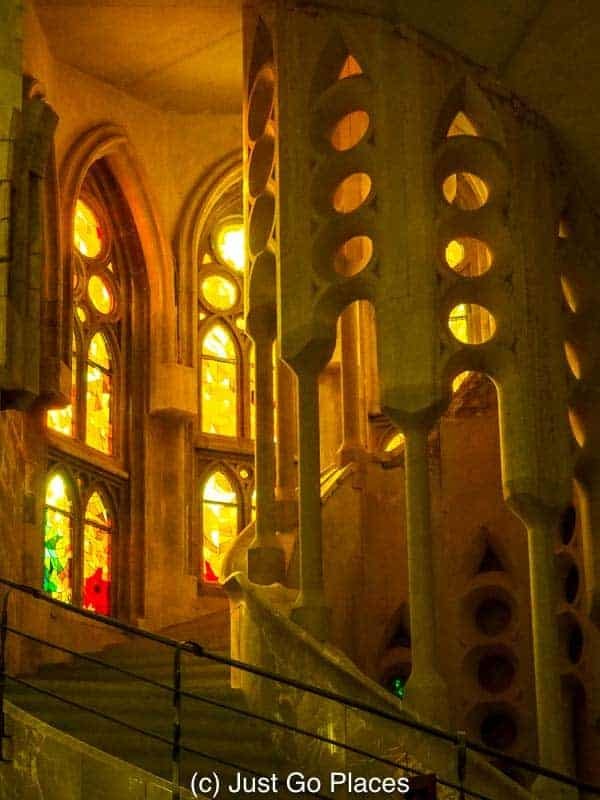 Even then, the grand proportions of the Sagrada Familia made the church a cool, if empty, space. Antonio Gaudi’s final masterpiece would far outlive him and skyrocket his name into the echelons of history. When we visited Barcelona with the kids a couple of years ago, I did not anticipate the huge lines. On this recent visit, though, I was smart and booked tickets ahead of time. 2.1.1 How did Gaudi die? 3.1.1 Keep in mind the time of day. 3.1.2 Buy tickets ahead of time. 3.1.3 You will need to pick between types of tickets etc. 3.1.5 Join our growing community of readers! Barcelona is the most visited city in Spain. 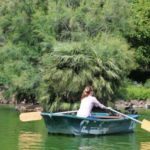 Many of its millions of visitors make two obligatory stops – La Boqueria, the famous market of the Ramblas for food, and La Sagrada Familia for some culture. La Sagrada Familia gets some 3 million visitors annually. Gaudi accepted that La Sagrada Familia is a long-term project that he would not live to see completed. Gaudi’s masterpiece is an expiatory church which means that it is built with donations from the public. Now that visitor numbers, and related ticket sales, have increased, the church receives about 25 million Euros a year. There are still 4 central towers to be built which will reach 170+ metres and let light into the interior. The current towers that you see will be dwarfed by these new towers because they are only 98 metres in height. The really tall towers will stand just underneath the height of nearby Montjuic. 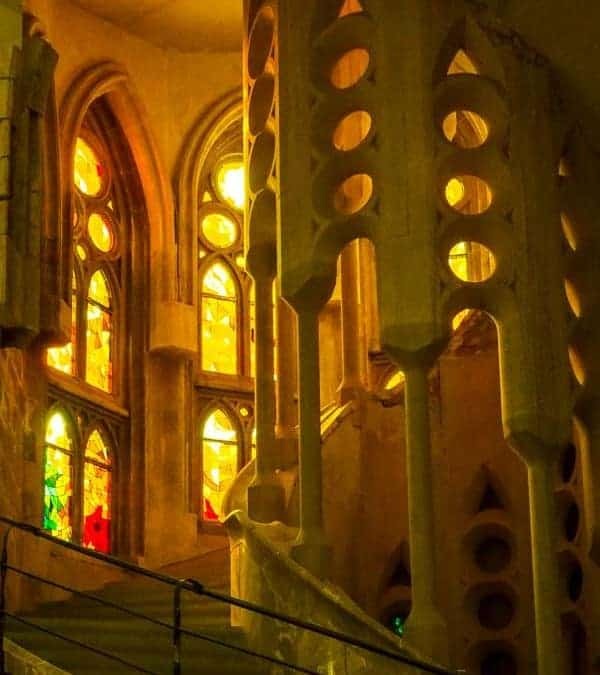 Gaudi did not want his work to rise taller than that of God. This model shows how tall the to-be-completed towers will be. The decorative tops of the existing towers. 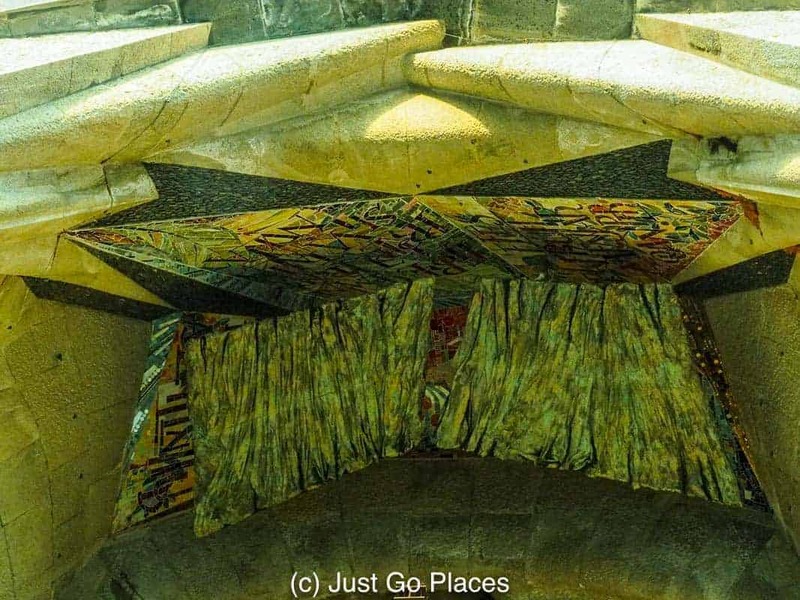 The Sagrada Familia interior has a pleasing symmetry because Gaudi created it in multiples of 7.5 metres. 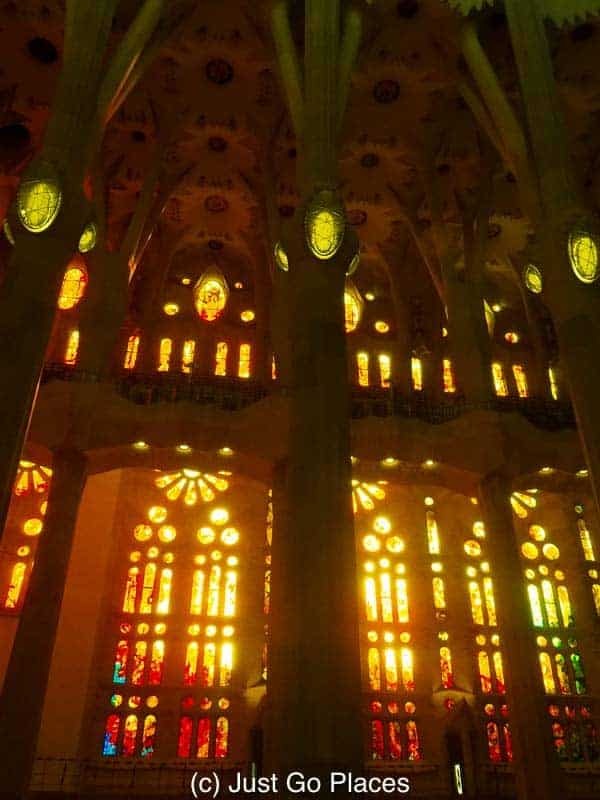 As an architect, Gaudi did not want a giant altar piece obstructing the view of his architectural lines. Many people are taken back by the simplicity of the altar piece. You get a giant cathedral and a small altar. 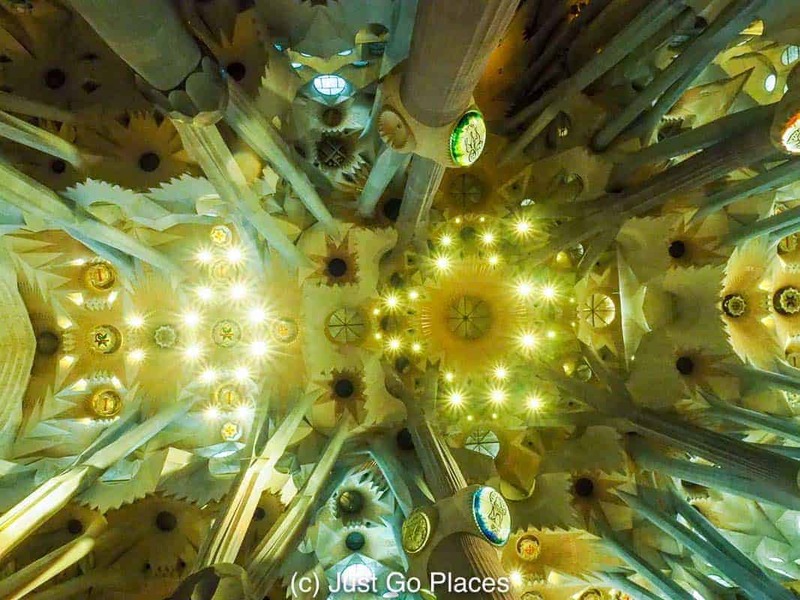 The inside of the Sagrada Familia is supposed to be an homage to nature, a garden forest rising up to the skies. The inside is practically bereft of statues except for the Holy Family and the local patron saint. Gaudi really wanted very little distractions inside the church. The four pillars inside are dedicated to the four evangelists. The pillars inside reach the top to create a treetop canopy. The afternoon light is stunning through the stained glass. 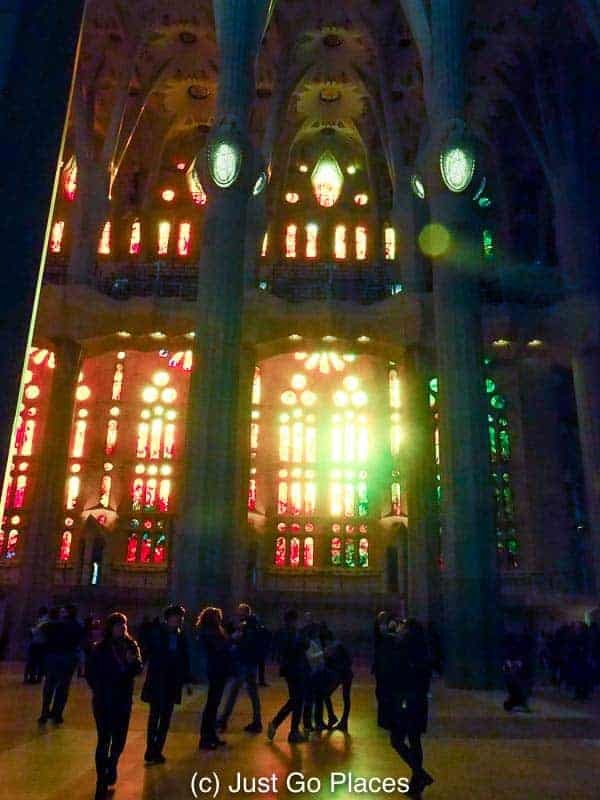 The stained glass bathed the cathedral in glowing colors. The East windows with their blue and green stained glass. You can see the colors mixing in the purple light cast by the blues from the windows in one side and the reds cast from the other side. Yes, I was obsessed with the light through the stained glass. Seriously I could not get enough of the afternoon light through the windows. Just wow! The stained glass is a secondary glazing technique that goes over the windows. These windows have not been finished with the stained glass topping yet. 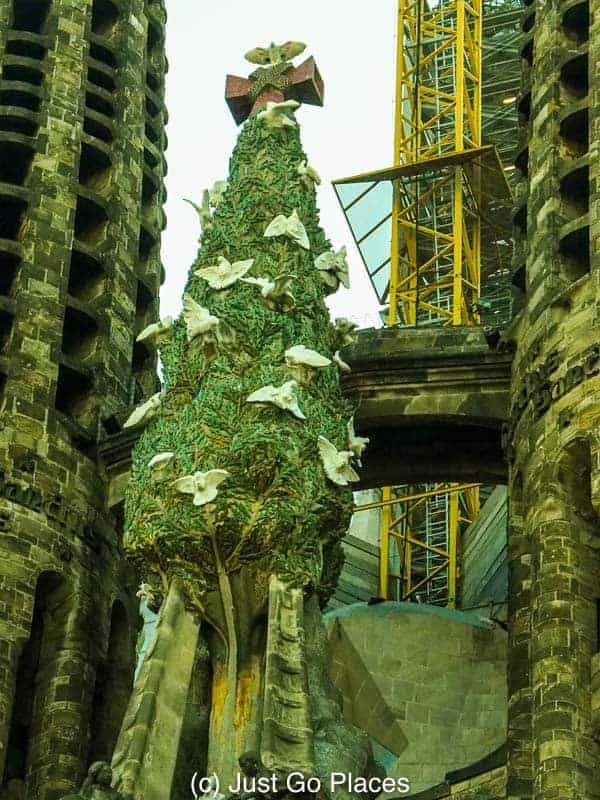 The Nativity Facade was completed during Gaudi’s lifetime because he wanted to show people his vision in the hopes that they would donate money. Gaudi liked to use real people to model his figures. The soldier in the scene depicting the killing of the innocents was the local butcher. The butcher had 6 toes on one foot, a detail which was faithfully recreated on the sculpture. Check out the bottom of the pillars of the Nativity entrance. One rests on a turtle and another on a tortoise, a land based and a water based animal. This subtle reference to the two sides of life in Barcelona the mountains and the sea was a nod to his benefactors. The Nativity facade overflows with references to birth and nature – such as the Cypress tree used to represent the tree of life. 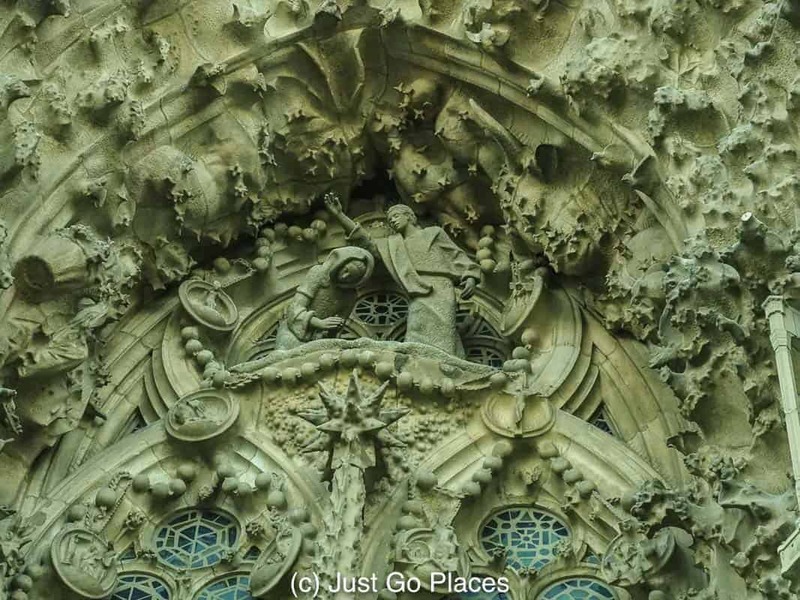 The doors of the Nativity facade show insects and other natural animals. The Tree of Life with doves rising up to the X on top symbolising Jesus. It’s hard to know where to look on the Nativity facade. This bit depicts the angel Gabriel appearing to Mary announcing she is pregnant with Jesus. Gaudi himself was the second lead architect. 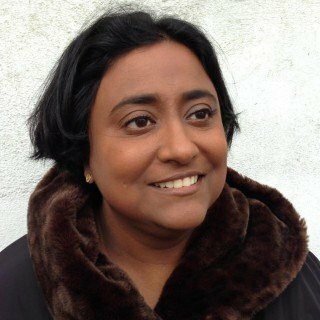 The church is now on its 9th lead architect who leads a team of 20 architects. People joke that there could be a 10th architect soon because the current architect is embroiled in a dispute over his mosaic design on the Passion facade. 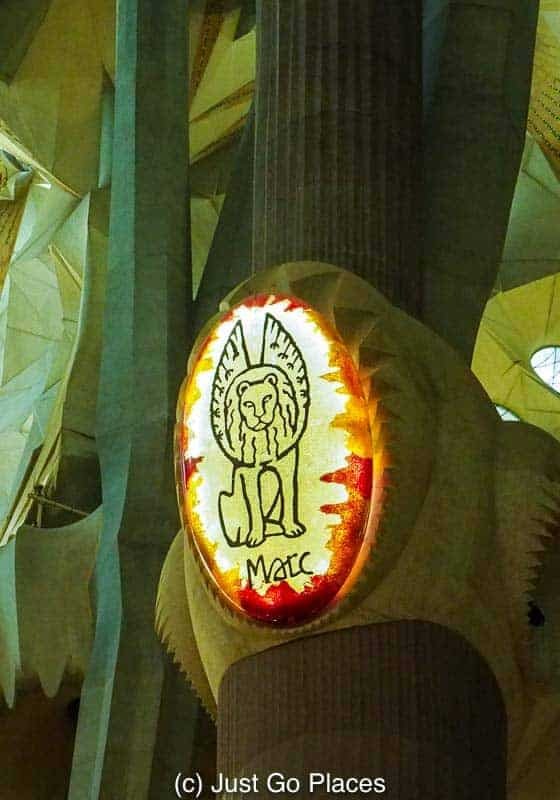 The other architects think the mosaic does not fit in with Gaudi’s mournful vision for the Passion facade. Gaudi’s profile is immortalised in the Passion facade. Architects used the oil painting technique of chiaroscuro which creates light and shadow to convey the sadness of the scene. 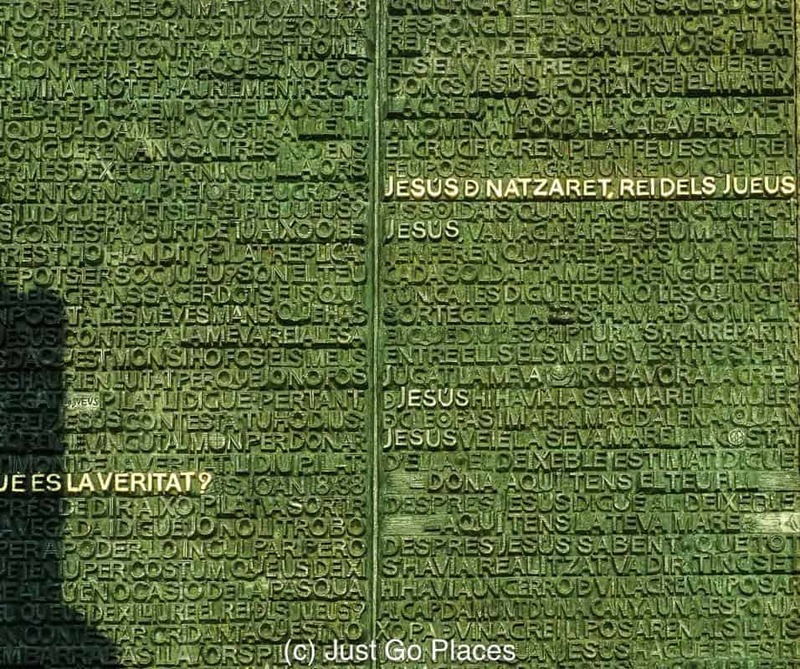 Catalan sculptor Joseph Subirach created the giant doors with words from the Bible. Jesus hanging on the cross, or possibly hanging off the cross. The Passion Facade with Jesus of Nazareth King of the Jews written above. 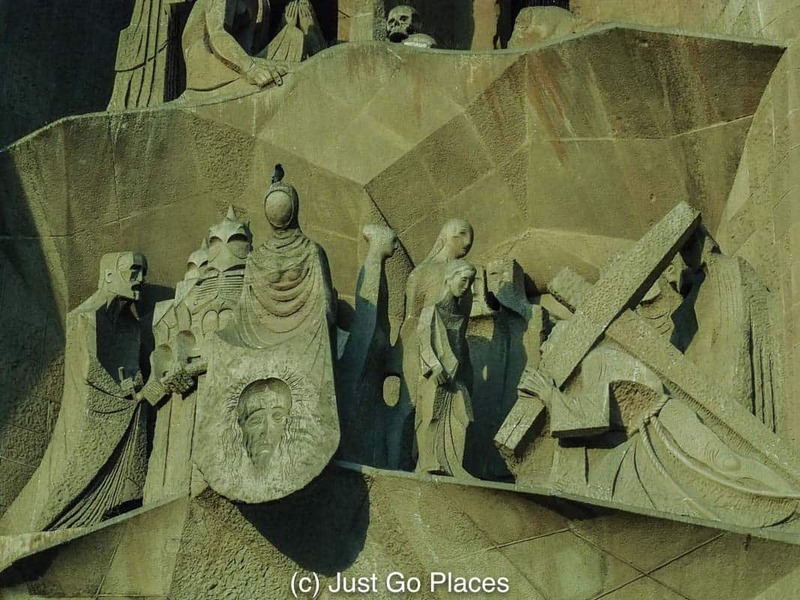 That’s Gaudi himself to the side of Veronica who wiped Jesus’ face. The offending coloured mosaic is covered up temporarily. 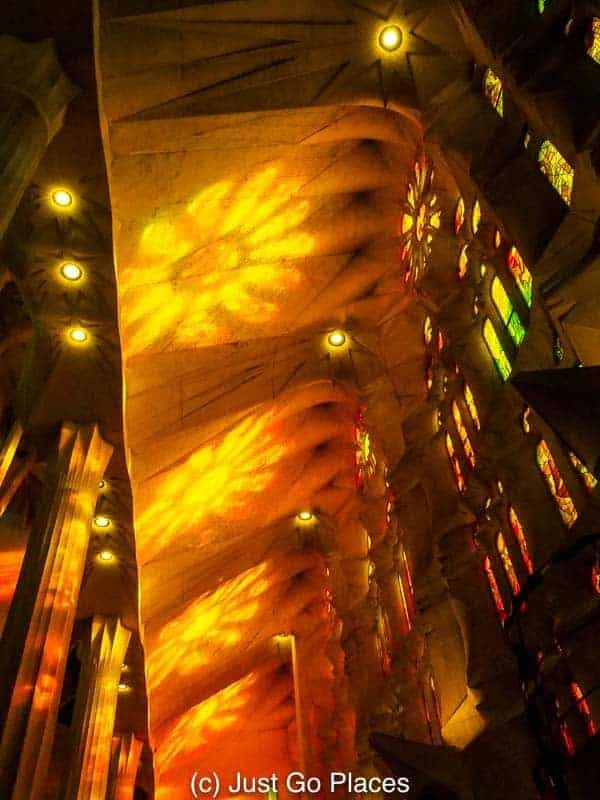 Even though Gaudi had a clear vision for La Sagrada Familia, he accepted that you could not reign in an artist’s creativity. He left instructions that allowed future artists to have a certain amount of leeway in how his vision would be interpreted. During the last 10+ years of his life, Gaudi worked feverishly to leave models, drawings etc for how the Sagrada Familia should look. He actually lived in his studio at the Sagrada Familia. 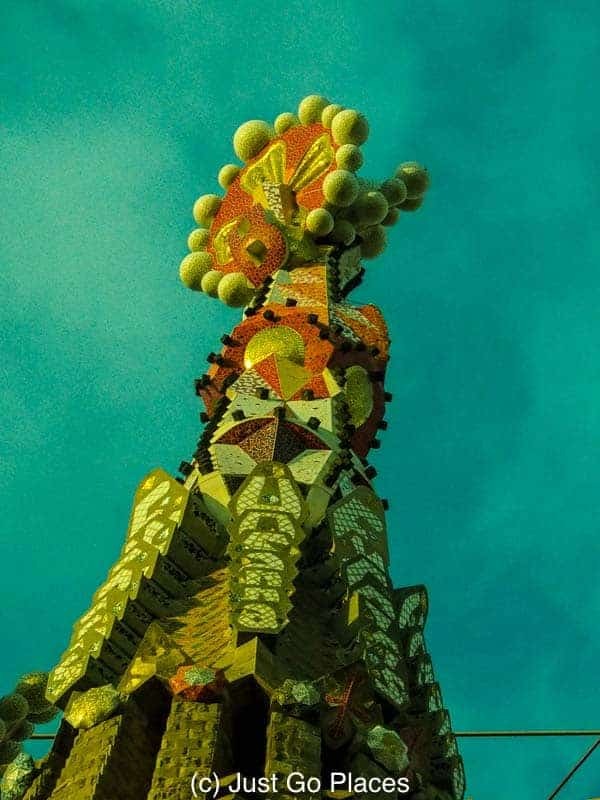 Gaudi created clouds in his vision for the 3rd facade, the Glory facade, which is still to be completed. The Glory facade represents the risen Jesus in heaven with clouds floating around. Architects though have no idea how to create floating clouds like he intended. 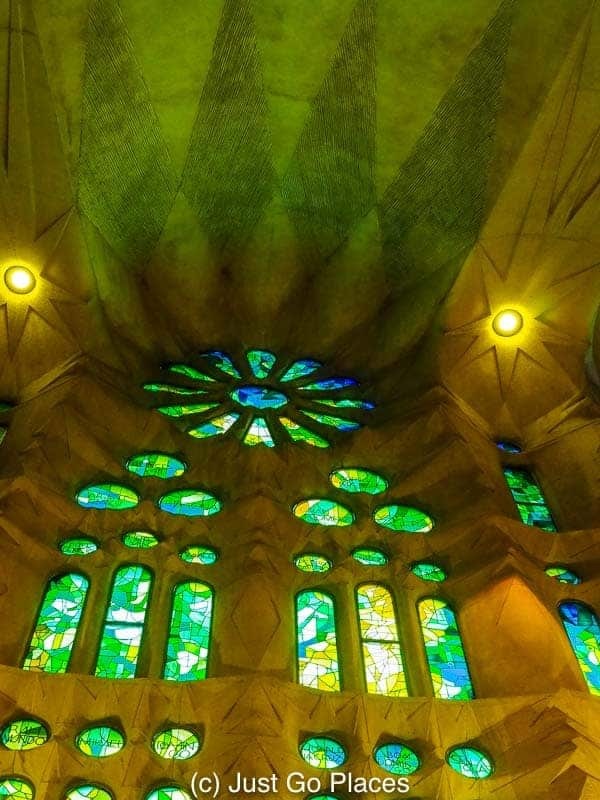 Gaudi assumed technology would have caught up with his vision – they still have 9 years to figure it out if they want to make the 2026 self-imposed deadline. The door at the Glory facade is the only part that is finished. 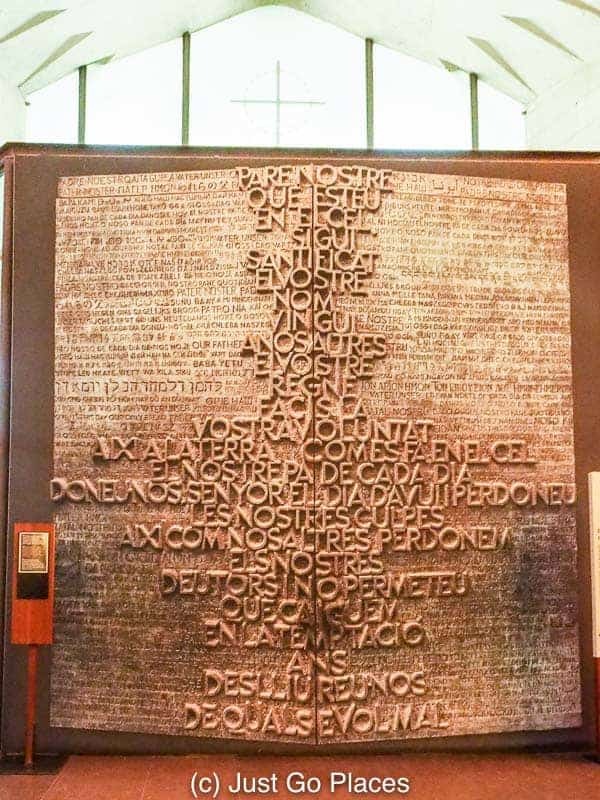 Created by Catalan sculptor, Josep Subirach, the door depicts the Lord’s Prayer in 50 different languages. During the Spanish Civil War happened, the Spanish Catholic Church had a vested interesting in protecting its own wealth and influence. They sided with Franco’s Fascists against the Republicans. 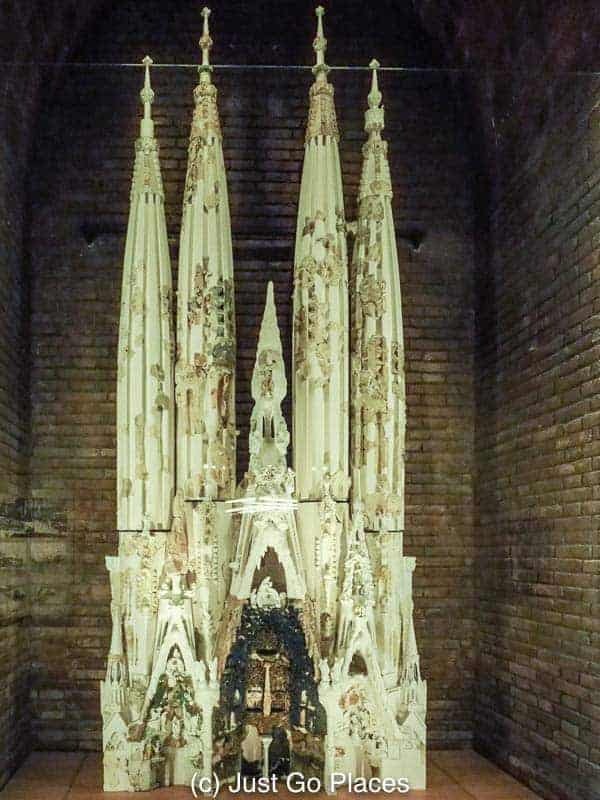 In response, Republican rioters destroyed churches including Gaudi’s workshop at the Sagrada Familia. Post-destruction, architects were left to piece together what Gaudi had wanted to do from the rubble. 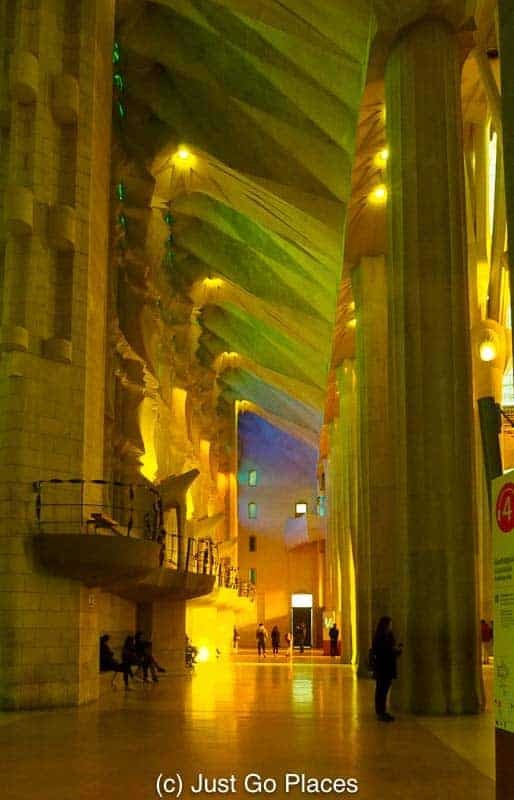 Gaudi is buried in a crypt which can be seen in the museum adjoining La Sagrada Familia. The crypt is actually in the basement equivalent of the church which was completed by the first architect. So, ironically, the area where Gaudi is buried is not his creation although the structure above his tomb is. Gaudi had an unfortunate and accidental death. He was run over by a street car on the way to church on a Sunday. 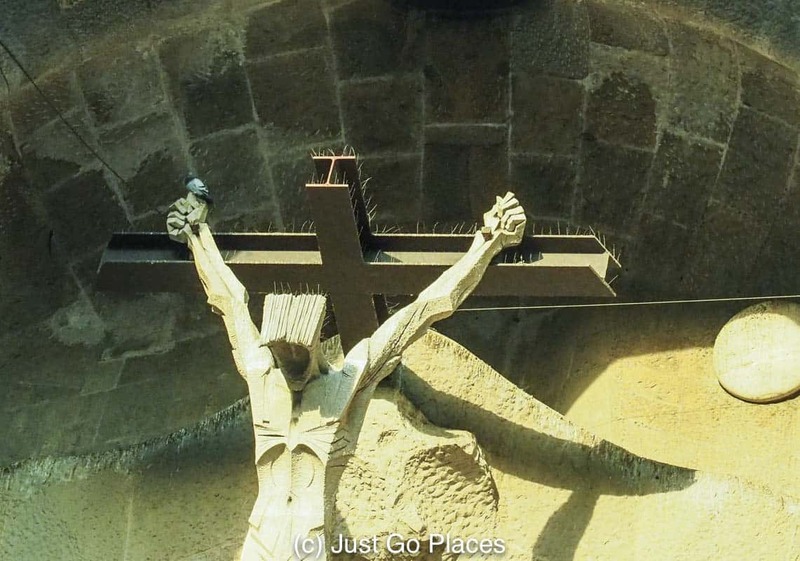 When his workers arrived at La Sagrada Familia on the Monday, no body could find him. When they searched for him, they discovered his unidentified body. Everyone is working at top speed to finish La Sagrada Familia so that it is finished in 2026, the centenary of Antonio Gaudi’s death. Considering the middle towers aren’t even built yet, and they are building with crowds of tourists all around, the most famous church in Barcelona has plenty of work left. I’m just going to assume that if you go to Barcelona you will visit La Sagrada Familia. Everyone does for good reason. 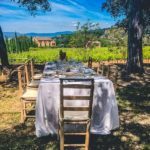 Here are some tips to help you get the most out of your visit. Keep in mind the time of day. Keep in mind that the best light for the church occurs at the extremes of the day. The morning sun lights up the cooler blues and greens of the stained glass East windows. The afternoon sun sets off the fiery oranges and reds of the the west windows. When the afternoon sun is low enough, the light reaches across the entire cathedral mixes with the blues and greens to create shades of purple. I highly recommend that you buy tickets ahead of time for visiting La Sagrada Familia. In low season, the tickets are easy to book a day or so ahead of time. You need to allow longer in peak season especially on a Saturday or Sunday. During the summer season, the cruise ships come into Barcelona port depositing 14,000 visitors at a time. 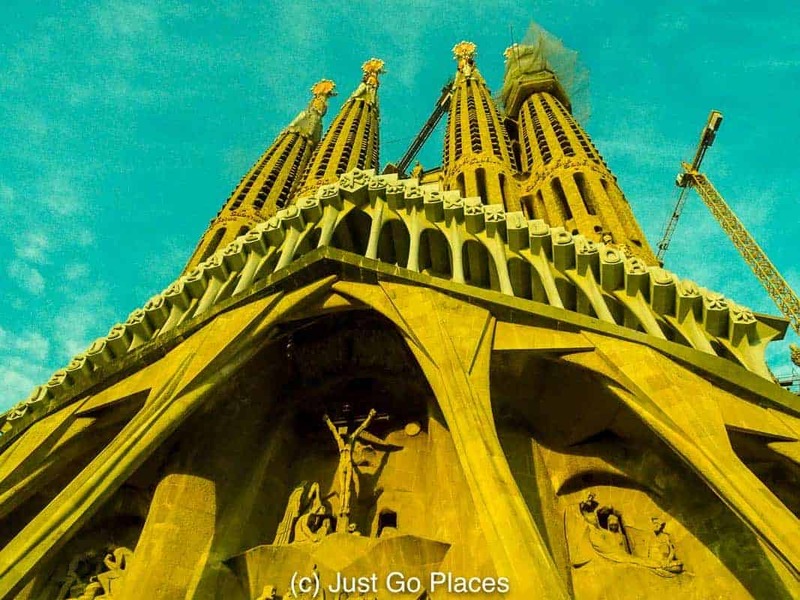 The most famous church in Barcelona is also one of its most visited sites. You really don’t want to stand in line for an hour or two in the scorching summer heat. You will need to pick between types of tickets etc. 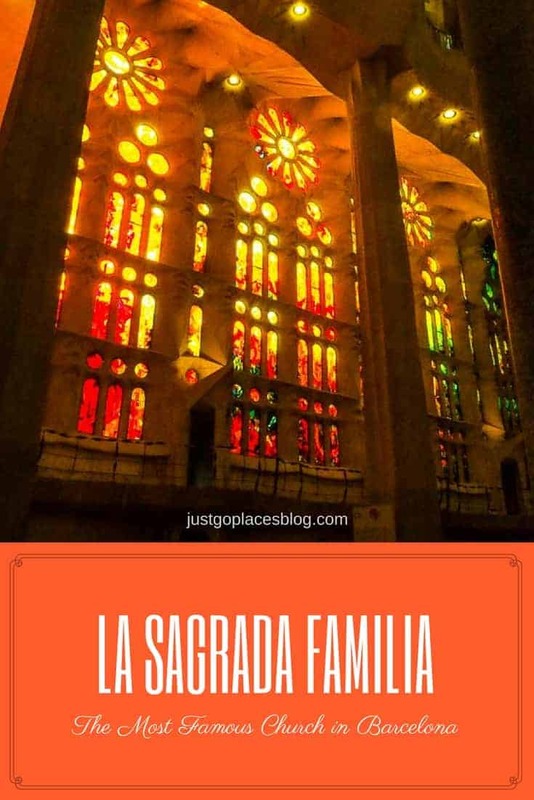 There are a handful of different types of Sagrada Familia tickets. They range from the basic €15 ticket to the church to the €29 ticket which includes a trip up a tower to get panoramic views of the city. I bought only the basic ticket and regretted it. You can also get tickets that have an audio tour or a guided tour. I have heard the audio tour is excellent – enough information without going into too much detail. I chose to take a guided tour (not through the Sagrada Familia website) but with Context Travel. Whenever I can fit in a tour, I try to use Context Travel. 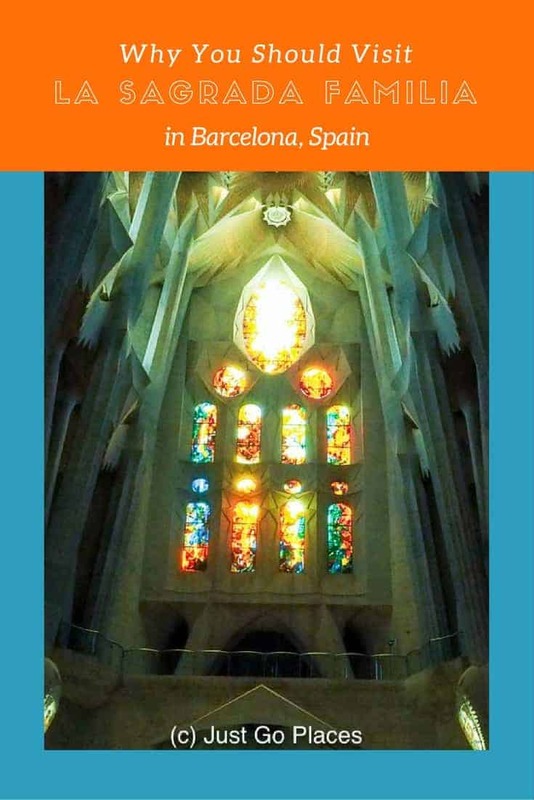 I paid full price for my Sagrada Familia Context Tour which I was happy to do so because I think they are worth it. I absolutely love the colours streaming through those windows. I can never make my mind up about this building though. On the one hand, I find it fascinating and incredible and Gaudi is a genius. On the other, though it is hard not to wonder whether he was sane – it is such an eclectic mix of architecture. I guess that is what makes it so irrestible. I found the Nativity entrance a bit much personally. Just so much stuff happening. I preferred the interior which was more streamlined. On my trip to Barcelona, I didn’t get tickets ahead of time and didn’t feel like waiting on line, so I didn’t go inside. I know I’ll go back to Barcelona one day, so I will be prepared! It is so beautiful.These are some pretty cool facts – most I had no idea about! We made that mistake last time because I remember just wandering in 1997. I’m looking forward to going back and seeing how construction is going. There’s a lot left to do. It’s insane how much detail goes into every little thing. The windows and structure makes it look like a caleidoscope! I would actually like it see what it looked like 20 years ago. I enjoy seeing the construction of things before they are built. The structure and what everything is made of. What I remember is going to the top of a tower (not very tall) and looking out at just an empty interior. No wonder not many people wanted to go inside! It’s totally on my bucket list! This is at the absolute top of my bucket list. Your photos and detailed information are fabulous!! I just love this place, it’s so crazy to look at an imagine the amount of work and detail that have gone in to it. I found the bit about the nativity scene fascinating, how people were modeled after locals, like the 6 toed butcher. How cool! Great recap, everyone should see this at some point in their day. He’s forever immortalised isn’t he?? Probably not a long-lasting fame that butcher expected he would ever receive. I loved visiting Barcelona 10 years ago. By that time, the Sagrada Familia was still in construction, but it was still very interesting for me to see it. I also remember that I visited his Houses and Parco Guell, which were very interesting with their unique style. The houses and Parc Guell haven’t changed but you will definitely notice a change in the Sagrada Familia. I was there eight years ago and it was very cool, but much less impressive than it seems now. 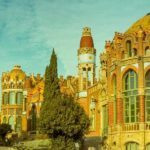 There are so many cheap flights to Barcelona right now, I might have to go back and see it again! I think it’s only going to get bigger and better. The towers that are going to be built will dwarf the towers that are currently there. I’m sure we’ll go back to see it nearer completion. As you said, Barcelona is so easy to get to and such a nice city in itself. Just beautiful. This will be the year I finally make it to Barcelona. I just love the unique architecture. Barcelona is a beautiful city that you I would recommend visiting. Wow! That’s a ton of visitors – 3 million! I’ve always wanted to visit Barcelona and bask in Gaudi’s greatness and it’s still on the list! I love how much of the history you put into the post! Thanks for sharing background and beautiful photos! La Sagrada Familia really is amazing! I was overwhelmed when I saw it in Barcelona a year and a half ago. But I did not know that the butcher was used as a model for one of the soldiers in the facade! 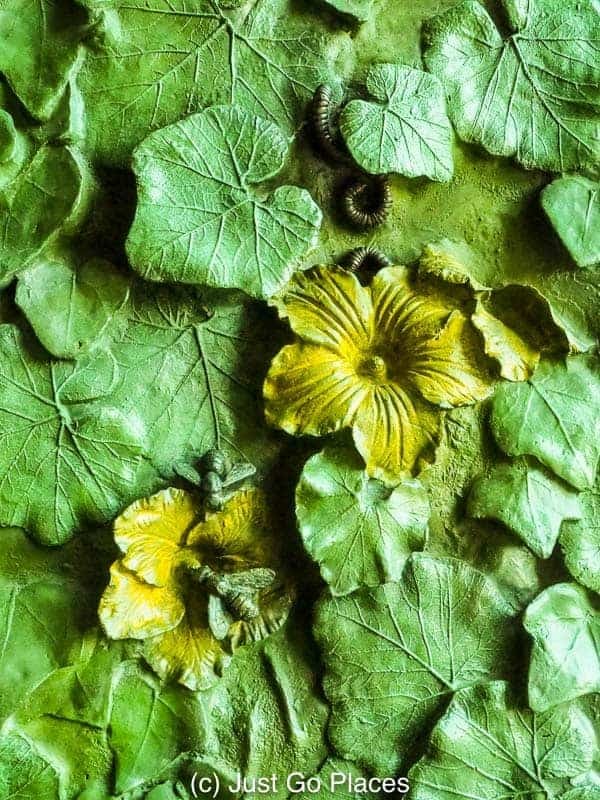 Gaudi was such a fascinating artist! He liked real models. There is a photo in the museum of the local model he used for Jesus. 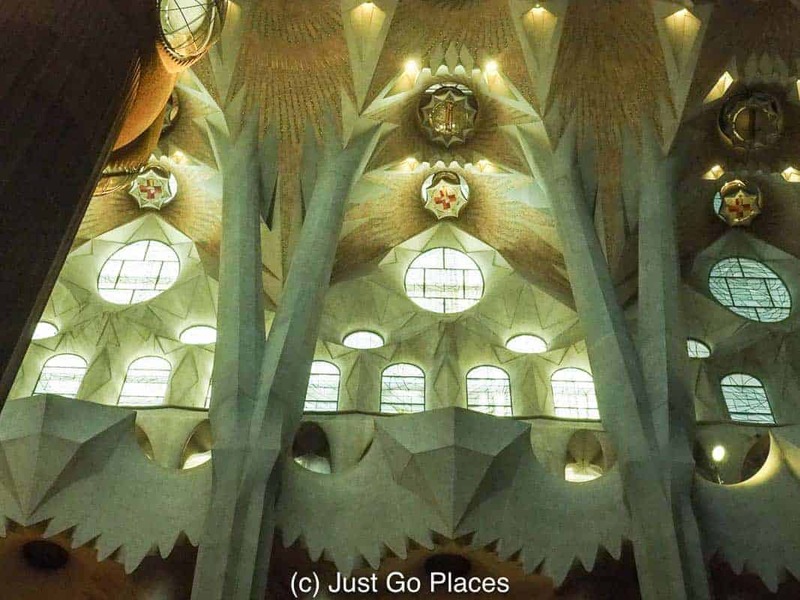 I visited the Sagrada Familia ten years apart too, and the difference was unbelievable! 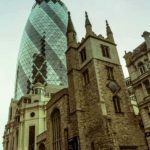 It is an incredible church, and i definitely recommend going – and buying tickets online in advance!! I’ve seen queues that stretch for several blocks, and no one wants to wait that long!! Yes, last time I went with the kids I didn’t buy tickets in advance and my kids refused to wait in a 2 hour line. Or more accurately, we refused to wait with them whining in the sun for 2 hours. 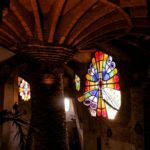 These are some really informative and fascinating facts about La Sagrada Familia.It would really be an awesome place once fully completed. The interiors of the Church are mesmerising, the stain glass windows blend with the light to create a surreal and ethereal ambience. Yes, I felt it was surreal too. We got upgraded as part of the Starwood points now that they are linked up with Marriott. The Arts is a Marriott hotel. THat is just stunning and clearly will be even more stunning when the entire thing is completed. Isn’t it amazing how much work has been done just in the 20 years since you last went though? I hope you’ll get to go again.. maybe in another decade, to see more of it in completion. It’s just beautiful. I’d love to go again closer to completion. I really was shocked by how much was done in 20 years. Really – 20 years ago there was nothing inside. Yes, it’s pretty spectacular. I wonder if I will ever see it finished!